A Symposium on Agroforestry, Relevance and potential in promoting local and global sustainable development was held at UNU Tokyo on 16 December 09. The discussion covered both theoretical and practical issues including its relationship with the Satoyama approach. It explored the current situation and significance of Agroforestry. ■ Prof. Kazuhiko Takeuchi (Vice Rector, The United Nations University (UNU)), opened the symposium by greeting the attendees on behalf of the organizers. His address was followed by further words of welcome from Mr. Shuji Kira (Parliamentary Vice Minister for the Ministry of Foreign Affairs), Mr. Yorimitsu Tsumoto (Director-General,Private Forest Department, Forestry Agency, Ministry of Agriculture, Forestry and Fisheries) and Mr. Tsunao Watanabe (Deputy Director-General, Nature Conservation Bureau, Ministry of the Environment), who delivered greetings on behalf of the co-hosting entities. 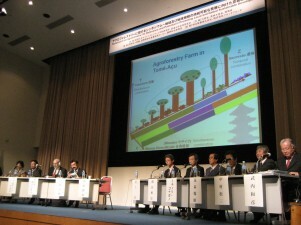 ■ Session 1: In the session entitled “The Present Day Significance of Agroforestry”, the speakers described conceptual similarities between agroforestry and satoyama/satoyama landscapes and the effectiveness of agroforestry as means of counteracting phenomena such as climate change and desertification, and promoting biodiversity, among other things. On the topic of satoyama landscapes, which contribute to biodiversity conservation, Prof. Takeuchi described the mosaic-like patterns of land usage, the human-nature relationships and the differences between satoyama landscapes and agroforestry. Based on discussions that took place at the 2nd World Agroforestry Congress, which was hosted by The World Agroforestry Centre (ICRAF) and the United Nations Environment Programme (UNEP) in August 2009, Dr. Garrity delivered a presentation on the significance of agroforestry in food security and conservation and recovery of natural resources and discussed measures for promoting agroforestry. 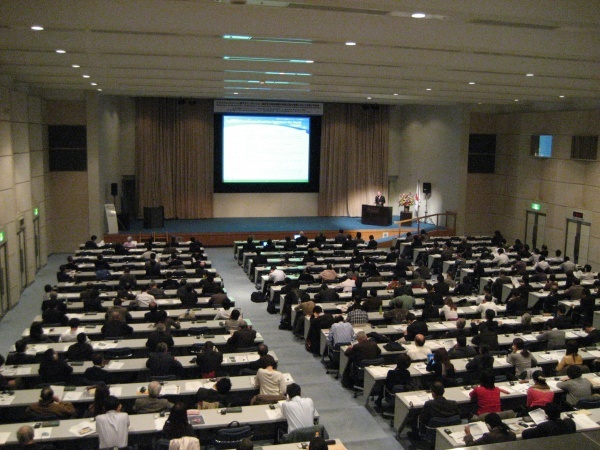 Mr. Natori described the activities of “The Satoyama Initiative,” an undertaking that the Ministry of the Environment and The United Nations University Institute of Advanced Studies (UNU-IAS) have joined forces to promote in the lead up to The Tenth Conference of the Parties to the Convention on Biological Diversity. ■ Session 2: In the session entitled “Good Agroforestry Practice”, the speakers provided information on case studies in Brazil, Indonesia, Malaysia and Paraguay. In the case of Brazilian case studies, there were presentations in which companies involved in the industry provided detailed information on the commercialization of sustainable agricultural products, as well as a presentation from the perspective of sustainable agriculture. Various other case studies were presented: an Indonesian case study, where agroforestry has resolved land disputes and thus contributed to watershed management and enhancing the lives of small farmers, a Malaysian case study, where a technical study on conserving rainforests by using agroforestry has succeeded, and a Paraguay case study, where obtaining Clean Development Mechanism (CDM) approval for small-scale tree-planting has made it possible to use credit to stimulate development of the rural villages concerned. Mr. Konagano described agroforestry projects conducted by Brazilians of Japanese descent in the city of Tome açu since the 1980′s as sustainable agriculture that placed a high value on biodiversity. Mr. Nagasawa explained from the point of view of companies that import the products of agroforestry in Tome açu, Japanese consumers can also support the reforestation of the Amazon by purchasing such products. Among the things that Mr. Aramori described were how it came about that Japan began to import cocoa, the key product of agroforestry in Tome açu as well as what they expect for the future. Dr. Agus described a case study in which agroforestry on the island of Sumatra has contributed to suppressing the deposition of sediment in hydroelectric reservoirs, as well as securing stable coffee harvests and, therefore, securing incomes. Dr. Nakamura introduced a technical case study in Malaysia. He explained appropriate crop selection and other activities for securing incomes in the short term, as well as suitable tree-planting methods for regenerating tropical rainforests in the mid to long term. Mr. Matsubara described a case study in Paraguay where rural development methods through small-scale tree planting are being developed. This project is underway owing to collaboration between the Japan International Research Center for Agricultural Sciences, The Ministry of Agriculture and Livestock (Paraguay) and Ministry of the Environment (Paraguay), among other entities. The same practices were first recorded at a small-scale CDM tree-planting project that was operated by the United Nations in September, 2009. Dr. Yamada explained agroforestry in Tome açu, focusing mainly on technical aspects. Prof. Inoue touted “collaborative governance” as a social system for sustainable forest management, based on open-minded localism, commitment principles and fair profit sharing, among other things. Mr. Miyazno provided an overview of agroforestry-related collaboration projects conducted by JICA, particularly case studies in Ethiopia and Laos. Mr. Yokota provided information about a project that HANDS is currently operating in Manicoro in the Western Amazon, Brazil, which aims to enhance the lives of local residents through agroforestry. Following the presentations described above, the panelists continued to exchange opinions, focusing mainly on global issues associated with promoting agroforestry and local issues in the Amazon region. 1. As international interest in climate change and biodiversity grows, it will be extremely constructive if agroforestry, satoyama projects and other related endeavors which carry out sustainable forestry and agriculture while conserving forests become more widely understood, both within Japan and overseas. 2. Ideas about agroforestry, which is also known as “agriculture that produces forests,” and the practical application of those ideas will not only promote economic and social development of local communities through sustainable forestry and agriculture, it will also make an extremely significant contribution to solving global issues such as climate change, biodiversity loss and desertification. 3. The Satoyama Initiative and the World Agroforestry Centre (ICRAF), which share a common awareness as well as activities to promote agroforestry, must strengthen their collaboration. 4. The following points will be the keys to the success of agroforestry projects. 1) Technical aspects: popularizing proper cultivation etc.-related know-how. 2) Social aspects: suitable relationships between the local residents who will implement the projects and external participants. 3) Economic aspects: the role of commercial activities as the “engine” that will drive agroforestry projects. Although there has been renewed awareness of the technical problems and governance-related issues concerned with agroforestry, the most important thing is for agroforestry to be positioned as a chiefly company-oriented engine which, in and of itself, will drive society, rather than ‘protecting’ what is vanishing. In projects, it is important that the activities are such that various stakeholders are involved and are able to reap benefits, through the enhancement of technology, systems and marketing. 1) It would be beneficial if the World Agroforestry Centre (ICRAF) strengthened its links with the Japanese government and the UNU. We anticipate developing the discussion further when we co-host a side event at The Tenth Conference of the Parties to the Convention on Biological Diversity (CBD/COP10), which will be convened in October 2010. 2) In terms of the aid provided by industrialized nations to developing nations, reform of the ODA Scheme would be beneficial. A movement that contributed to the improvement of the environment by taking into account the environmental impact of development assistance, rather than merely considering the amount of assistance, would be beneficial. Finally, Prof. Govindan Prayil, Director of UNU-IAS (Vice Rector of UNU) made closing remarks on behalf of the hosts and thus, the symposium was concluded.